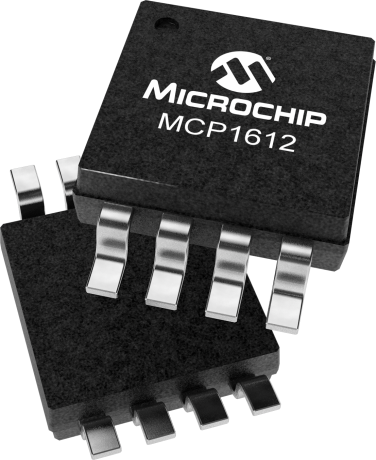 Microchip’s MCP1612 DC-to-DC converter offers the customer a compact and inexpensive method of efficiently converting battery and bus voltages to the lower voltages required by various circuits within their systems. This device is available in space efficient MSOP and DFN packages, and in the case of the DFN, thermally enhanced. Because the power FET and synchronous FET are integrated, minimal external components are required. Likewise, due to the high switching frequency, the requisite external inductor and capacitor can be minimized. Since the output voltage is adjustable with an external resistor divider, only the base device need be stocked to provide the customer with a multitude of output voltage variations.